This week’s beer is from the Boston Beer Company – a brand much better known by the name it shares with its flagship product, Sam Adams. Despite the brewery’s storied place in American craft beer history, as the second-largest independent brewery in the United States (after Yuengling), Sam Adams doesn’t always get much respect from beer snobs. It’s easy to dismiss the company as too big, too mainstream, too conservative – especially these days when the obscure and experimental nanobrewery down the block is turning out barrel-aged, sour imperial IPAs infused with passionfruit and cacao nibs, while Sam Adams is about as corporate as craft beer gets. But it really wasn’t all that long ago that Sam Adams was often the only craft beer you could expect to find on tap at many bar and restaurant menus, and – perhaps more than any other American brewery – Sam Adams deserves a lot of credit for being the gateway brand that converted the masses in those early days. Admittedly, I don’t absolutely love everything they make, and with such a saturated craft beer market, it’s easy to pass up that old Sam Adams variety 12-pack in favor of the latest trend in a lovingly corked and waxed bottle. But I still order Sam Adams Boston Lager regularly just to remind myself what a dependable, solidly-made beer it is – and because it tastes great. The company has come a long way since founder Jim Koch was hustling from bar to bar in Boston, and with its present scale of production, Sam Adams is capable of offering a wide range of quality products to satisfy a variety of tastes. Far be it from me as the author of beer reviews on a birding website to accuse others of pretension, but condescending snobbery should never keep you from enjoying perfectly good beer. Especially when it has a bird on it. 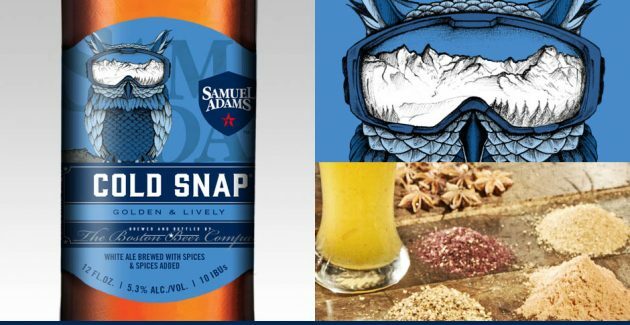 Sam Adams has been brewing Cold Snap as a late winter seasonal since 2014, but a packaging redesign of this year’s version places a ski-masked owl on the label. The owl has ear tufts, but besides that fieldmark, I’m afraid this week’s bird is probably too stylized for a positive identification. The brewery calls Cold Snap an unfiltered “white ale” with “spring spices”, which is to me a hint that it draws its inspiration from witbier, a Belgian wheat beer style with a reputation for playful spicing (Blue Moon Belgian White is the most famous example to American drinkers, though Hoegaarden deserves all the credit for rescuing the style from near-extinction in the late 20th century). Like many traditional witbiers, Cold Snap is flavored with coriander seed and orange peel, to which Sam Adams has also added hibiscus and plum, which contribute fruity and floral stonefruit aromas to this hazy, orange-hued beer. The ripe bouquet recalls canned peaches, cherries, and apricot tart, along with a rounded hint of citrus and more fleeting suggestions of vanilla, white pepper, and star anise. The palate is sweet without being cloying, plummy and lightly biscuity, with a bright finish of maraschino and citrusy coriander. A light body and prickly carbonation keeps Cold Snap refreshing to the end. When it comes to birds and beer, I take what I can get and I suspect many of the beers reviewed here at the 10,000 Birds “Birds and Booze” beat might be difficult to track down – so it’s nice to review a good, nationally-distributed seasonal beer for once. I’ve been seeing this one everywhere. In this respect, Cold Snap would have been a perfect recommendation for Superb Owl Sunday two weeks ago. Sure, it’s an easy drinking wheat beer, from one of America’s best-known breweries, fine for knocking back a few on the couch while watching the big game. 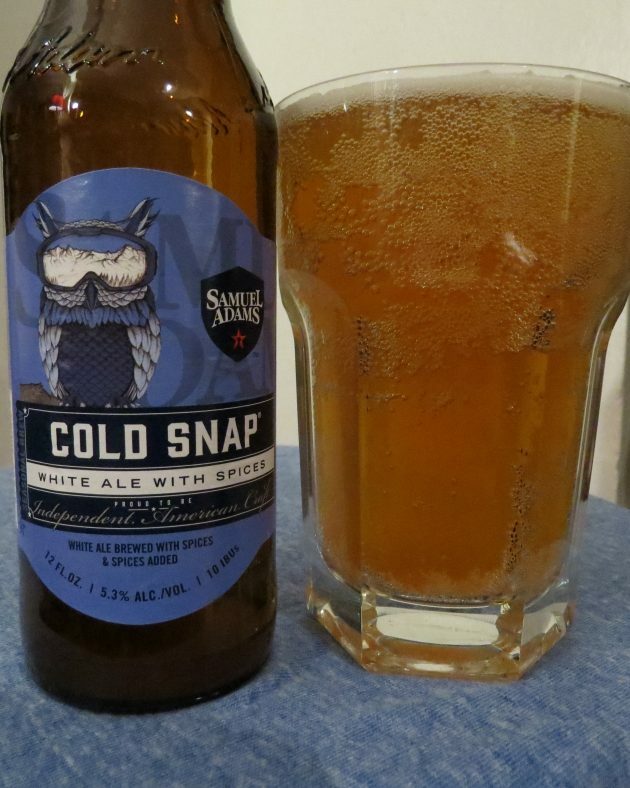 But while that season is over, the birding year is still young, and I think Cold Snap would taste even better as a nightcap after some late-winter owling. It was, Pat – cheers! Where Are You Birding This Third Weekend of February 2018? Why Don’t I Have Any Finches At My Feeder? Where Are You Birding This Second Weekend of November 2010?